Heat oven to 325°F. Grease bottom and side of 8-inch springform pan or 9-inch round cake pan with shortening. In 2-quart heavy saucepan, melt 1 cup chocolate chips and 1/2 cup butter over medium heat, stirring occasionally. Cool 5 minutes. Stir in flour until smooth. Stir in egg yolks until well blended; set aside. In large bowl, beat egg whites with electric mixer on high speed until foamy. Beat in 1/2 cup sugar, 1 tablespoon at a time, until soft peaks form. Using rubber spatula, fold chocolate mixture into egg whites. Spread in pan. Bake springform pan 35 to 40 minutes, round cake pan 30 to 35 minutes, or until toothpick inserted in center comes out clean (top will appear dry and cracked). Cool 10 minutes. Run knife along side of cake to loosen; remove side of springform pan. Place cooling rack upside down over cake; turn rack and cake over. Remove bottom of springform pan or round cake pan. Cool completely, about 1 hour. Meanwhile, add enough water to reserved raspberry juice to measure 1 cup. In 1-quart saucepan, mix 1/4 cup sugar and the cornstarch. Stir in juice and thawed raspberries. Heat to boiling over medium heat. Boil and stir 1 minute. Place small strainer over small bowl. Pour mixture through strainer to remove seeds; discard seeds. Stir liqueur into mixture; set aside. Place cake on serving plate. In 1-quart saucepan, heat glaze ingredients over medium heat, stirring occasionally, until chips are melted. Spread over top of cake, allowing some to drizzle down side. Place whipped cream in decorating bag fitted with star tip. Pipe a rosette on each serving. 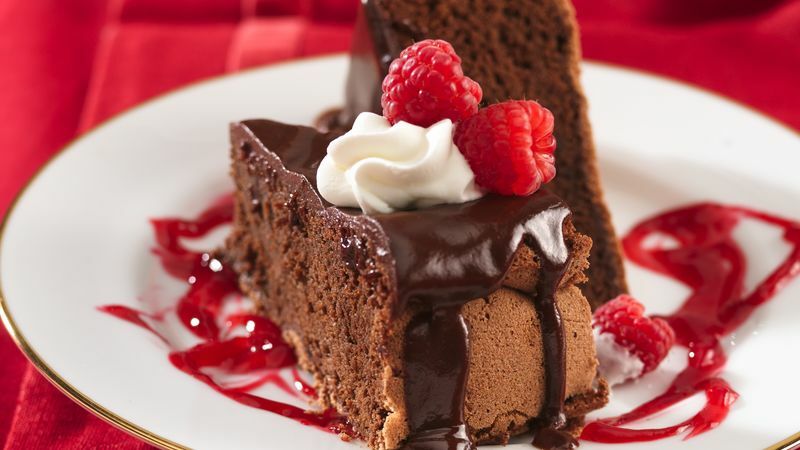 Serve cake with sauce. Garnish with fresh raspberries. Be as creative as you like with the chocolate glaze! Drizzle it over the cake using a fork, or place it in a plastic bag and squeeze it through a snipped corner. Chocolate Lover's Shortcut: You can make a single baked layer of Betty Crocker™ Super Moist™ devil's food cake mix as decadent as this cake. Just stir 1/2 cup miniature chocolate chips into the batter before baking, then follow the directions in step 4. Freeze the other layer so when the rave reviews come in, you can make this dessert again!